Now you can show your support with a Kamala Harris bag, t-shirt, or cap! On sale are a canvas tote, a unisex tee in black and white, stickers and black baseball caps with “KAMALA” written on it yellow, blue and red. The world of campaign merchandise in America is an eventful one. During the last presidential election cycle we saw everything from $1,000 constitution copies to Bernie bibs, to Hillary’s “A woman’s place is in the White House” pillows, and, of course, the very successful “Make America Great Again” hats by Trump. One can only expect some more action this year, as the current presidential cycle, which is underway, continues to get more diverse and crowded. So, when on Martin Luther King Day, the junior Senator from California announced her presidential run, we were on the lookout for the Harris campaign merchandise. After all, she comes from an interestingly diverse background, has been a fiery attorney and senator besides currently being touted as one of the most watched 2020 contenders. Not only that, it looks like Harris has been carefully preparing her campaign strategy for long. If she built the momentum with the launch of her book, The Truths We Hold, just before the announcement, her campaign merchandise is out already. For starters, if you have already joined Camp Kamala, you can now say it with Kamala t-shirt, cap or a bag. The senator also posted a link where people can buy “Kamala Harris for the People” merchandise. Up for sale right now are a canvas tote, a unisex tee in black and white, a cap and also stickers. The Kamala black baseball cap with “KAMALA” written on it yellow, blue and red looks good and so do the other small collection of merchandise on offer right now. At $29.99 for a cap, or a tee, it doesn’t come cheap, but yes, it can be a good way to announce your preference for the upcoming 2020 elections. 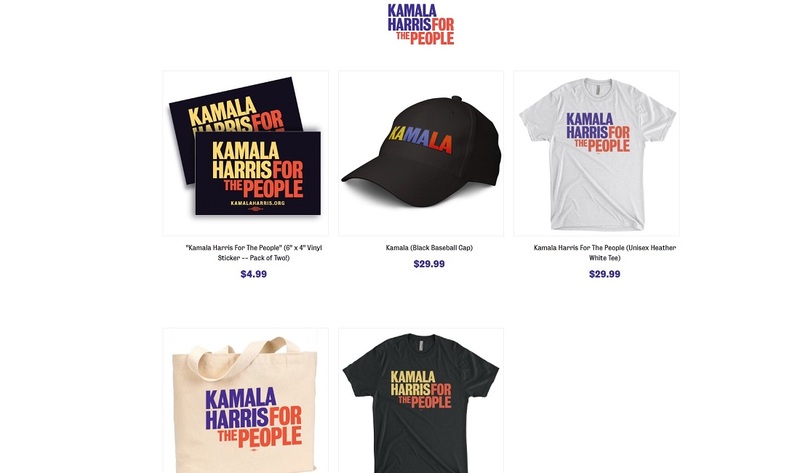 Apart from the merchandise at the Official Kamala Harris Online Store, it looks like the senator is already a big hit in the fashion merchandize department. A number of online retailers have already begun selling Kamala Harris-inspired merchandise. Etsy is also selling Kamala Harris-inspired t-shirt, including one with the senator’s picture emblazoned on it, and so are a number of other online retailers. But in case you are still making up your mind on who to vote for in 2020, there are also Tulsi Gabbard for 2020 and Julian Castro t-shirts on Amazon to choose from!